"Mayochup" could be coming to the U.S., according to Heinz. “Pass the Mayochup” could soon be a thing – if Twitter says so. Heinz is asking condiment lovers to vote for whether its highly talked about blend of mayonnaise and ketchup will make its U.S. debut. 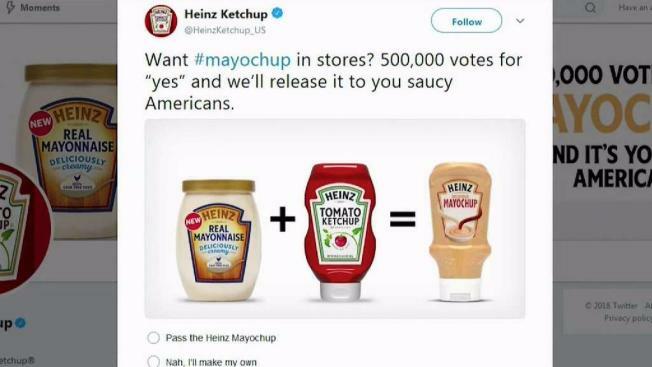 If the company’s Twitter poll closes Sunday with 500,000 votes in favor of the condiment combo making its debut, Heinz will bring Mayochup to the U.S. But don’t worry, for those who prefer other names like Ketch-o or Ketchonnaise, Heinz knows the Mayochup name isn’t exactly a social media favorite and will also put the final name up for a vote – should the sauce launch in the U.S.
With three days of voting still to go, the poll sat Friday at more than 690,000 votes. Of those votes, 55 percent opted to “pass the Heinz Mayochup” and 45 percent said, "nah, I’ll make my own."